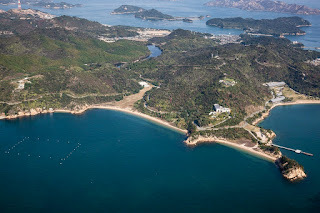 Naoshima is an island in the Seto Inland Sea of Japan. 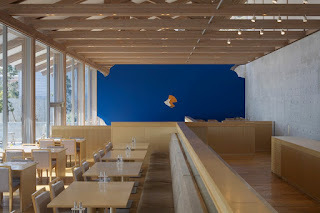 In the past 25 years it's been developing as an art destination thanks to the vision of Tetsuhiko Fukutake, founding president of Fukutake publishing, and Chikatsugu Miyake, mayor of Naoshima. Fukutake Corporation, founded in 1955, was renamed Benesse Corporation in 1995. I've taken all the photos except as noted. Above: To get to Naoshima from Tokyo you take a couple of trains, and a 15 minute ferry ride. Hypnotic watching the farm land speed by from the train. 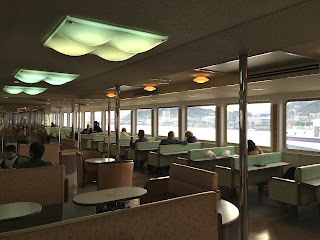 Above: The ferry to Naoshima...fond memories of ferries to Vancouver Island growing up make me very happy to have a reason to be on one. Above: On the deck of the ferry white Saarinen chairs seem to float on the glossy green deck. Above: Out the window you can see many islands in the Seto Inland Sea. 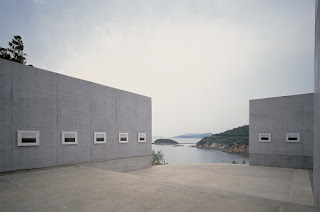 Naoshima has most of the museums and art installations, but there's also a beautiful museum on Teshima, as well as a couple of other projects, and there are galleries and installations on Inujima, an island farther north east. The umbrella name for all the projects on the three islands is Benesse Art Site Naoshima. On the island Benesse Corporation has developed a number of projects. 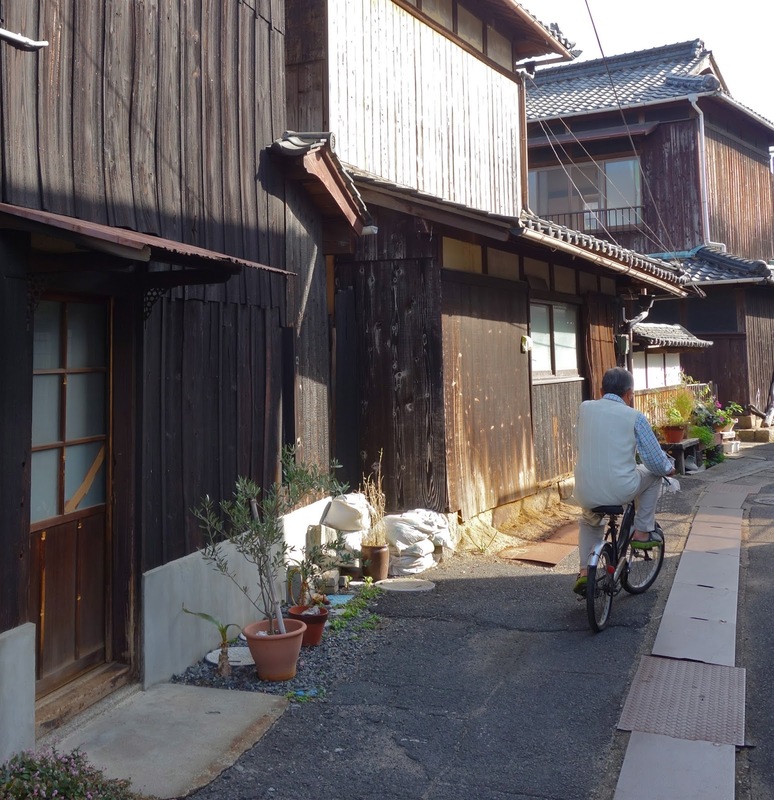 The new architecture is designed by Tadao Ando and there are old homes faced in charred wood and galvanized metal. 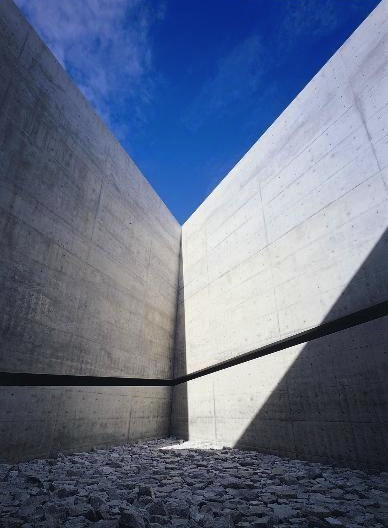 Ando's designs use a soothing plain concrete in a myriad of ways to create three minimal but elegant hotels, and three small museums, as well as a museum for his own work. The old homes have a quiet beauty and harmony, and some of them have been turned into art installations. Above: At the Benesse House Museum, Hiroshi Sugimoto's exterior installation, "Time Exposed". Most people who stay at Benesse House have dinner at the museum restaurant, and have a chance to walk around the Benesse House Museum after hours. You can also take a hotel bus to one of the two small towns on the island...Honmura or Miyanoura Port, where the ferry comes in. There's only one taxi for the whole island. Above: Detail of cement in the Benesse House Beach Hotel. Above: View from a room in the Beach Hotel. Above and below: Sunset light near Benesse House. Above and below: Glass and ceramic pieces brought back from the beach at Naoshima. Above: Early morning light, a ship passing through the islands. Above: Near the Benesse House beach, a tree with a sculptural form. Above: Benesse House cafe for breakfast with an ocean view. Above and below: Art installation by Cai Guo-Qiang, "Cultural Melting Bath: Project for Naoshima". In the middle of a group of Taihu rocks from China is a hot tub for bathing in amidst the installation. 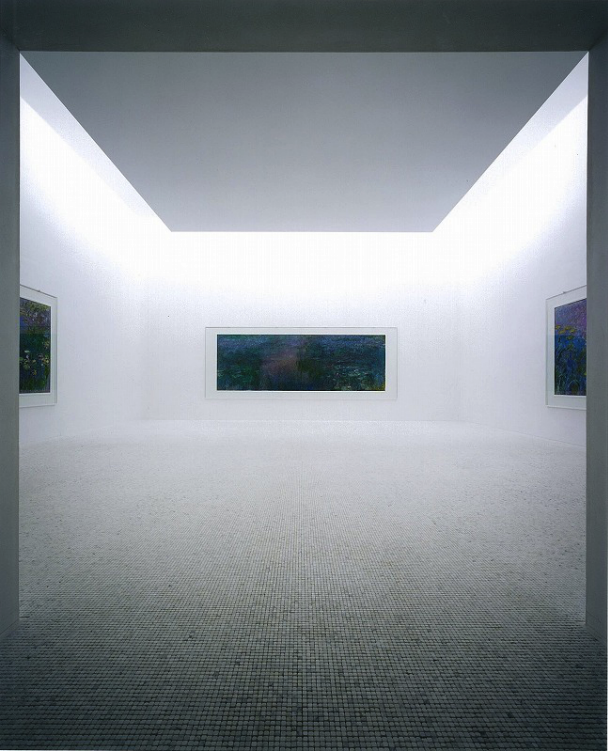 Above: A short walk from the Cultural Melting Bath, is the entrance to the Lee Ufan Museum. 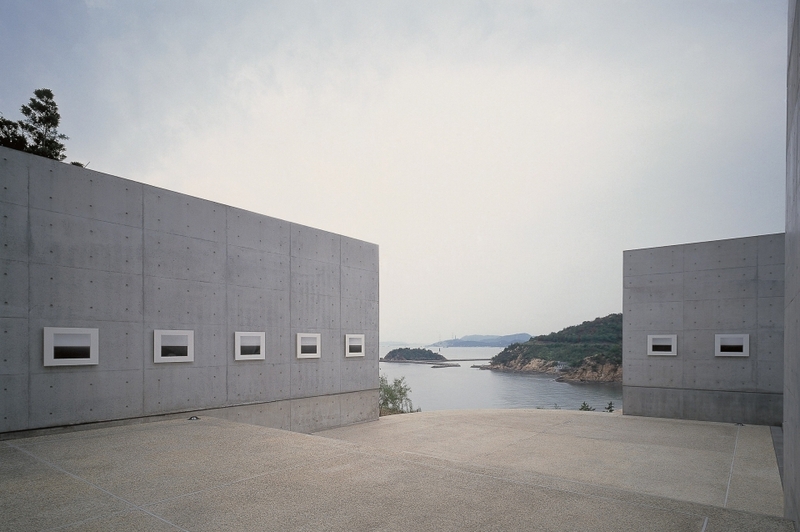 The museum, designed by Tadao Ando, in collaboration with Ufan, is small contemplative place. 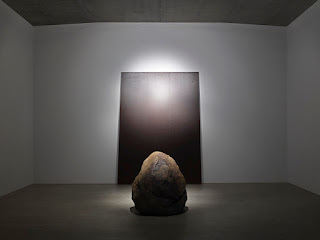 All the work inside is by Lee Ufan, from the 70s to present day. Above: Lee Ufan piece in the museum. Above and below: On the way to the Chichu Museum, you walk by this waterlily pond. 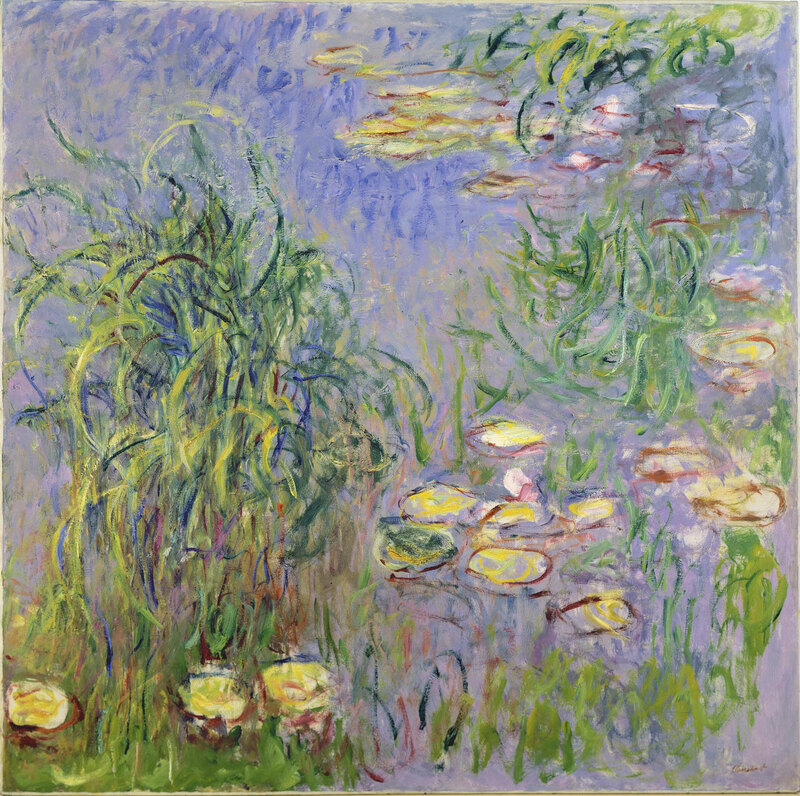 It's a reference to the overpoweringly beautiful Monet waterlily paintings inside the museum, in their dazzling white setting. 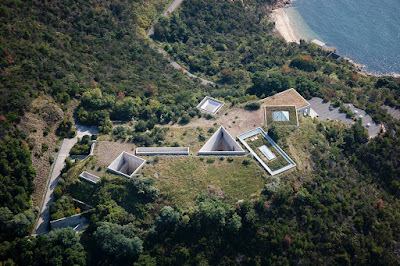 Above: View of the Chichu Museum from above. 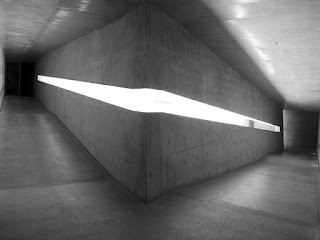 Most of the museum is set underground, with the open triangular and square structures creating elegantly simple passageways. 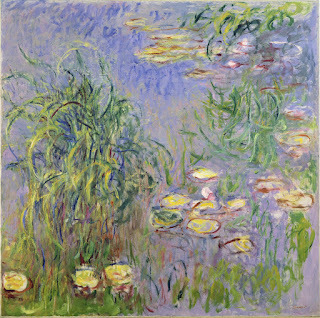 I believe the square form with the pyramid skylight is the Monet space. 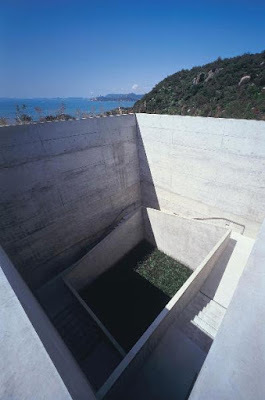 There are two James Turrell installations and one by Walter De Maria. Above: The triangular opening seen from the bottom. Above: Looking out from the slit window seen in the prior photo. Photo found here. Above: Stepping back a bit further from the slit window you can see the walkway inside. Photo found here. Above: The island is small, and a walk from the Chichu Museum to the town of Honmura where the Art House installations are located is beautiful and easy...less than half an hour as I recall. Saw this unusual flower on the way. Above and below: The town of Honmura. 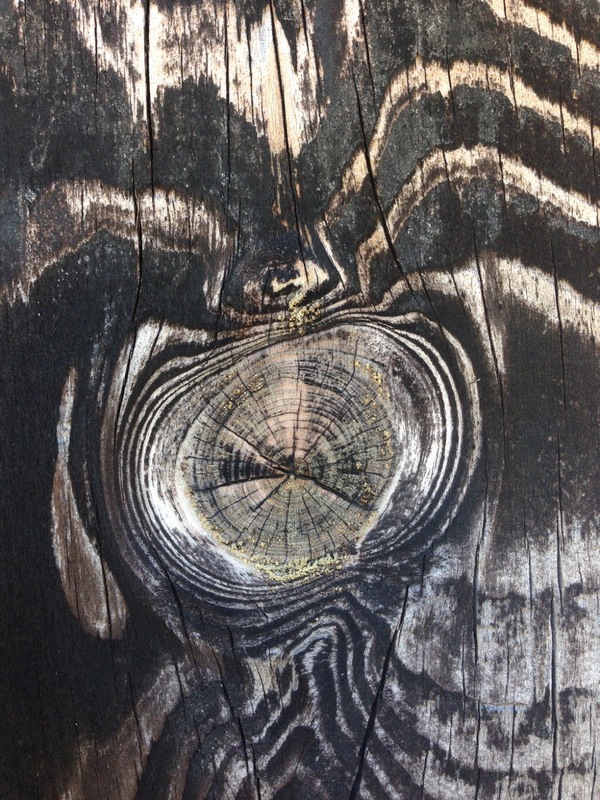 Most of the houses are faced with charred wood to fend off insects and rot and protect from bad weather. 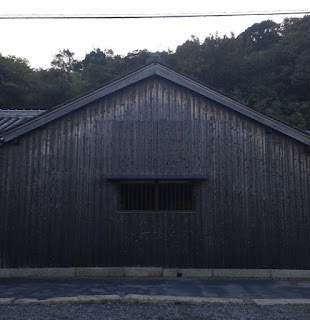 It's a traditional technique called Shou Sugi Ban, and creates a striking appearance. 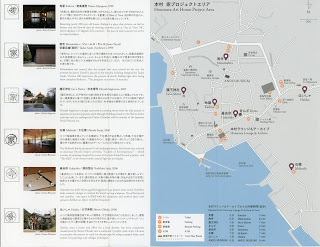 Above: There are currently six Art House projects open in Honmura. This is a ticket, which shows where they are, and which ones you've visited. Above: Outside one of the Art Houses, "Ishibashi". 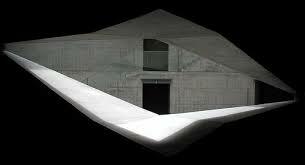 Inside there are a number of installations by Hiroshi Senjyu. Above: Detail of Hiroshi Sugimoto's addition to Go'o Shrine, a shrine located here since the Edo Period. Sugimoto added this new building with a set of glass stairs that continue under the earth in an underground chamber. Above: This was a structure built for a James Turrell installation by Tadao Ando, called Minamidera. Because of the size of the space required for his work a new structure was built, a modern structure using materials traditional to the town. 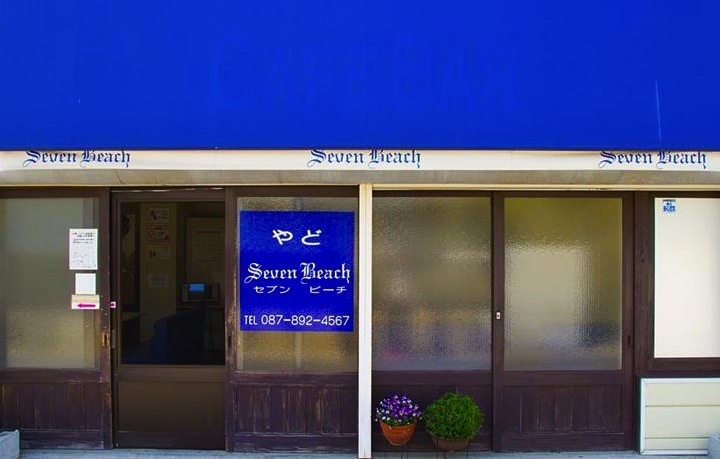 Above and below: Across the street from the Turrell installation, a sign for Roji To Akari guest house, operated by Mr. Kobayashi, the owner of the cafe shown below. Above and below: The most well marked cafe, and worth following the signs to. A really great atmosphere, up on a hill with a nice view, and delicious food. It's open for both lunch and dinner. Above and below: More signs to make sure you find your way. 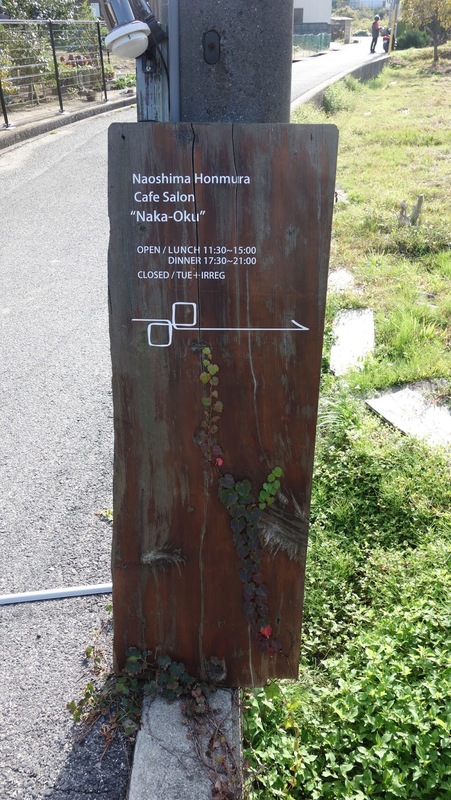 Above and below: At the top of a small hill, arrived at the "Nake-Oku" Cafe Salon, in Honmura. Above: Another material used frequently in Honmura is corrugated metal. The rust softens it and blends it in with the dark wood. Above: The curtains at the doorways all have unique and beautiful designs. 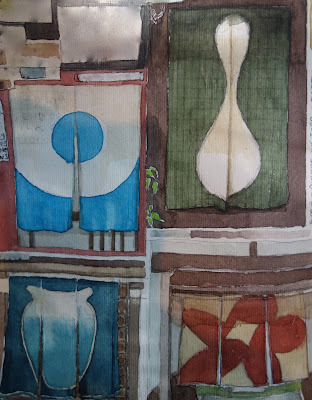 These, from my husband's sketchbook. Above and below: A small shrine in Honmura. Above: Persimmons are everywhere in the beginning of November. Here they're being dried to make "Hoshigaki". Above: Pale green yarn makes a design on the dark wood. Above: A nicely designed bench for contemplating the view. Above and below: There are a number of pleasant guest houses in Honmura, an alternative to staying at Benesse House. There's a list of them here. This one, Oomiyake, is on the list. It has a very pretty garden, and a cafe. Above: The garden at Oomiyake. 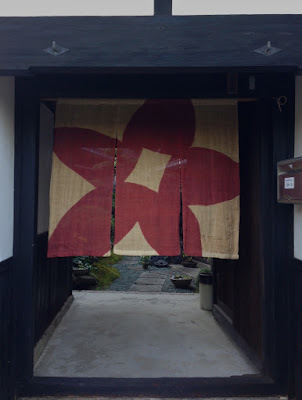 Above and below: A small cafe in Honmura, Seto Uchi. Above and below: We rented bikes in Miyanoura Port, and it was the best way to see Naoshima. We saw a mysterious cement ruin on a tiny island connected with a low bridge and stopped to check it out. Above: We didn't notice till we were on the island that there was a small shrine there. Above and below: The cutout windows make interesting frames to the surroundings. Above and below: There are two mysterious bunkers...one white, one black inside. 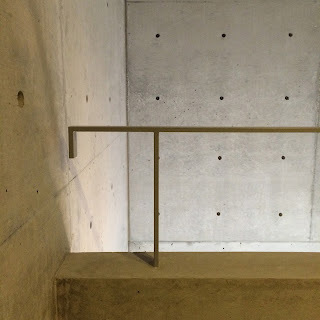 Above: Inside the white painted bunker. Above: Looking back at the island under a low hanging branch. Above: Between Honmura and Benesse House is a lovely bakery...Pan Tocori. Above: One of the art projects is a bathhouse in Miyanoura Port, designed by Shinro Ohtake. Above: In Miyanoura Port....we spent our second night here at Seven Beach, as Benesse House was fully booked. Though it's not a glamorous lodging, we really were very happy here. The owner was so friendly and helpful, spoke English well, and all the basics were covered, including a good internet connection. It's also on the guest house list here. A good location, just a few minutes walk to the ferry, and to the bike rentals too. Above: Steps into the water. Above: Someone has made a business of turning old floats into funny creatures. Below: Train back to Tokyo, golden sunlight fills the car. This is so beautiful and inspiring. Thank you for the breakfast bliss. So beautiful and informative, Laura. Thank you ! Hi Laura, Mary Gwynn sent me the link to your blog. My husband and I leave for Japan in a week. We're going to Naoshima and after seeing your intimate pictures, I'm so thrilled that we'll be there soon. Thank you! Have a wonderful time! It's a magical place. Beautifully composed pictures (and content). Feels so, how shall I say, Zen! So happy to discover this as we embark on our journey.